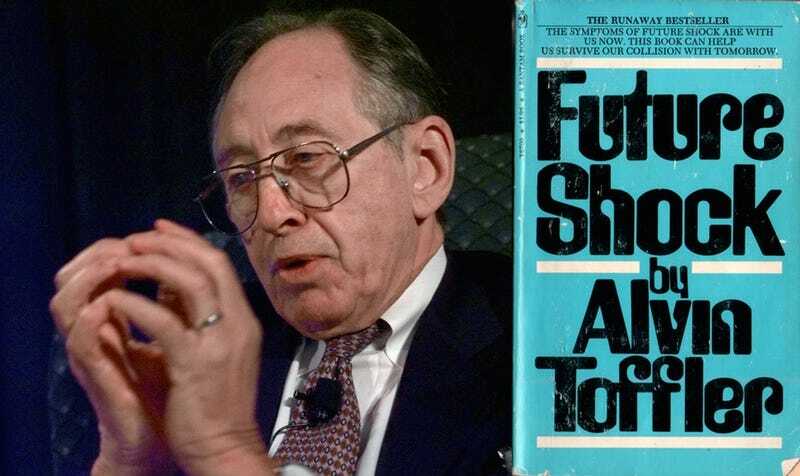 Alvin Toffler, arguably the most influential futurist of the 20th century, died on Monday at his home in Los Angeles. He was 87 years old. Toffler was the author of the 1970 book Future Shock, which was heralded for articulating the anxieties that so many people felt about the future. Future shock, according to Toffler, was a kind of mental disease that afflicted us all and stemmed from a sense that the future was arriving too quickly. Toffler’s books were distributed far and wide and translated into a number of different languages. Though there are plenty of legitimate criticisms of his conclusions, his work spoke to the fears that people had in the 1970s and 80s as the world became more connected and society seemed to be unraveling economically and socially. According to Bloomberg, the cause of Toffler’s death wasn’t released, but he had been ill for some time. I tried to schedule an interview with Toffler a few years back, but he was suffering from something that would not allow him to speak coherently with me. Alvin Toffler was a staunch liberal, but his old friend Newt Gingrich was a big believer in many of Toffler’s takes on the future. The two met at futurist conferences in the 1970s when, according to Toffler, Gingrich was one of the few conservatives who would attend. Toffler would write over a dozen books over the years and did consulting work for a number of corporations. Future Shock was adapted into a rather infamously technophobic short documentary hosted by Orson Welles in 1972. Whether you agreed with the conclusions of books like Future Shock and Third Wave or not, Toffler definitely helped make futurism a mainstream endeavor. He is survived by his wife and writing partner Heidi Toffler.